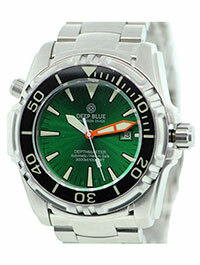 Deep Blue is an exciting watchmaker located in the vibrant city of New York. The company was founded in 2007 and is the brainchild of Stan Betesh. What distinguishes the brand from many of their competitors is the ability to produce high-quality timepieces at affordable prices. 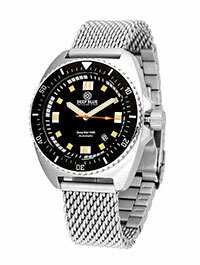 They have done this by concentrating on one specific genre, which is the diver watch. They also utilize the latest technology and best materials. Here are five of their marvelous timepieces that perfectly illustrate this point. 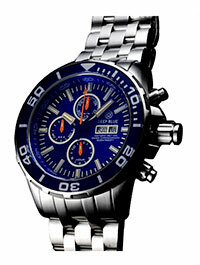 The Bluetech Master 500 is a robust watch that is designed for the professional diver. Dimensionally the watch has a generous 316L stainless steel case measuring 46mm. What makes this timepiece so attractive is the cool black dial with contrasting orange hour/minute hands. Other features include a scratch-resistant ceramic bezel and sapphire crystal lens. Powering the watch is a Swiss made ETA 2824-2 self-winding movement. The Daynight 65 T-100 is one of the company’s most exclusive watches. This timepiece is also one of their larger models and has a massive case measuring 47mm x 18.5mm. What makes this watch so impressive is the vibrant blue dial with sporty sub counter. Other details include Tritium tube (65 in total) filled hands/indexes and a 120 click Unidirectional Bezel. Beneath the durable exterior lies a Valjoux 7750 self-winding mechanical chronograph movement. 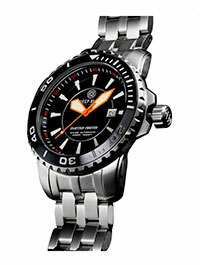 The Depthmaster 3000 is a fantastic watch manufactured to operate even under the most extreme conditions. With a mammoth 316L stainless steel case measuring 49mm x 19.5mm, this watch is not designed for the faint-hearted. What makes this timepiece so appealing is the bright green sunburst dial with oversized indexes and hands. Other elements include a black rotating bezel and manual helium release valve. At the heart of the watch is a 24-jewel Miyota 9015 mechanical self-winding movement. The Deep Star 1000m is a very stylish diver watch with a cool retro appearance. Dimensionally the watch has a well-proportioned 316L stainless steel case measuring 45mm x 16mm. What makes this watch so special is the sleek black dial with contrasting beige markers. Other characteristics include a black ceramic bezel and distinctive mesh bracelet. Powering the watch is a Japanese made Miyota 9015 mechanical self-winding movement. 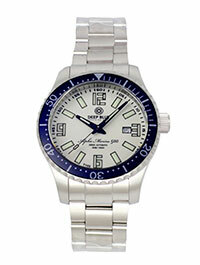 The Alpha Marine 500 is a high-quality watch that is water resistant to a depth of 500 metres (1,650 feet). With a brushed steel case measuring 45mm x 16mm the timepiece should appeal to a large variety of buyers. What makes this watch really stand out is the white dial with contrasting green numerals. Other features include slender black hour/minute hands, sapphire crystal lens, and a scratch-resistant bezel. Beneath the refined façade is a reliable Swiss made ETA 2824-2 automatic movement. For a dive watch that's sure to survive the harshest conditions, check out our full range of Deep Blue watches.